Australians are avid consumers of social media. As a nation we have been one of the earliest adopters of social media technologies. We polled the Australian members of our research panel, LiveTribe, to capture a snapshot of their social media habits so far in 2013. We found that consumers are spending increasingly more of their time on social media, and spreading that time across multiple platforms. With the ever growing number of ways to access the internet, especially mobile, social media continues to integrate seamlessly into more and more areas of our everyday lives. The study, conducted in March 2013, had a total sample of n=536* and polled respondents about their social media activities over the previous three months. The results of the poll showed, unsurprisingly, that the majority of people (88%) access the internet multiple times per day, and Generations X and Y make up more than half of that cohort (27% and 28% respectively). 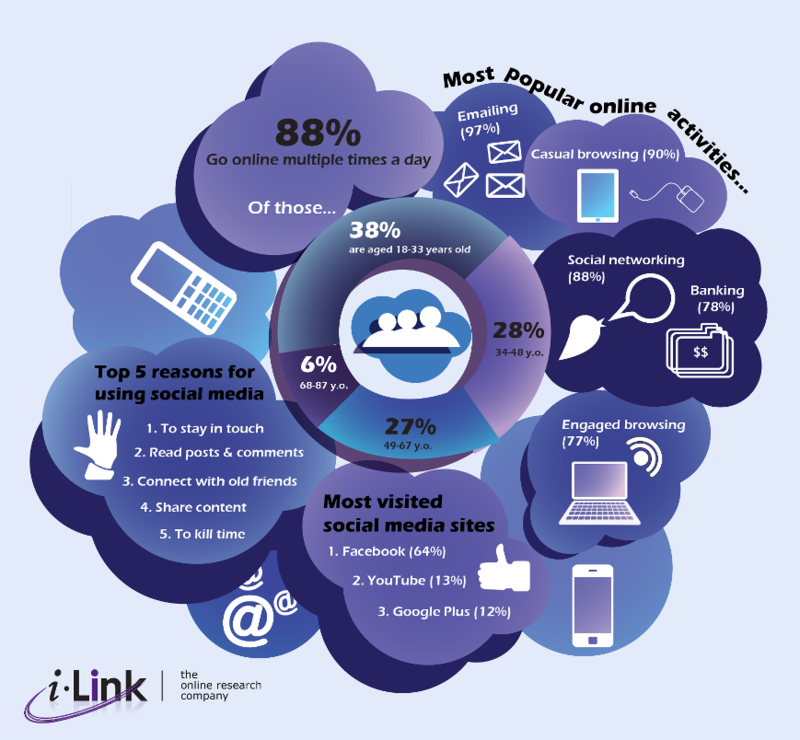 When asked what they do when they are online, the five most common activities were emailing, casual browsing, social networking, banking and engaged browsing, i.e. reading the news or searching for information. Facebook was the social media site most frequented by respondents in the prior three months (64%), distantly followed by YouTube (13%), and Google Plus (12%). Recent commentary promotes the use of integrated social media as an important way that businesses and brands can engage with their customers. Relatively younger sites such as Instagram and Pinterest continue to generate followership and interest, but for now it seems our poll findings indicate that Facebook is still the most prevalent platform when it comes to consumer engagement via social media. Australians are spending more time online and increasingly devoting greater amounts of that time to social media. With consumers ready and able to influence and shape their own brand experiences through these mediums, it is more important than ever for organisations to be in touch with the needs and wants of their customers, and ready to embrace the dynamic relationship that social media enables. Whether your interest lies in consumer products and services, new media or technology, i-Link Research has the expertise to support you in the deployment of your online research projects. For more information about our online field services, proprietary research technology, or consumer research panel, LiveTribe, contact our Client Services team: cs@i-linkresearch.com. *The poll sample was drawn representatively to match the Australian national distribution for age, gender and location, with the application of soft (+/-5%) representative quota controls thereafter.